Happy mid-April, everyone! The gardens have been slow as molasses this spring, thanks to the unnerving snow and bitter cold of March. 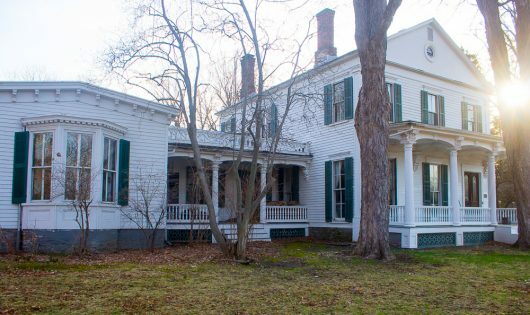 But today the birds are singing, the grass is greening, and hey — why not join me on a virtual garden tour? Although the temperature this morning is a brisk 38°F, it will supposedly warm to 64°F in the afternoon. So please dress appropriately. I recommend a G-string. And thermal underwear. And sensible shoes with 4-inch heels. SWOOSH! We are standing at the entrance to the boxwood garden. Several years ago, I started these evergreen shrubs mostly from stem cuttings. My how they’ve grown. Within the box-edged beds are various varieties of roses, including David Austin’s “English” types. We can visit this garden again when the roses are in bloom. And here’s the little herb garden. 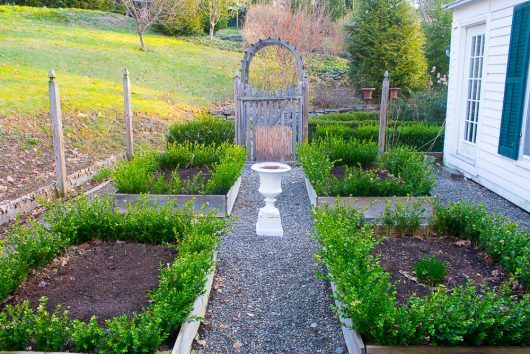 In April of 2014, I poked boxwood cuttings along the perimeter of garden’s 4 raised beds. The cuttings are full-size plants now, and, as you can see, they are in dire need of a haircut. That’s a maybe-tomorrow job. 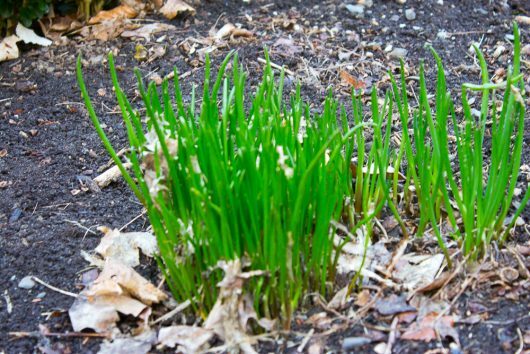 In the lower right bed, a clump of common chives has emerged. The mild stems are perfect for pesto. 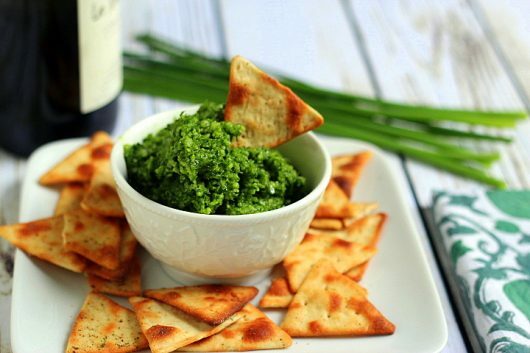 If you’ve never tried Chive Pesto, you must. It’s addicting! Click here for my simple recipe. The upper left bed is planted with carrots (including the new-to-me ‘Purple Haze’ variety) and purple-topped turnips. I’ve promised myself not to let the turnips mature to watermelon size this summer. Turnips are at their delicious best when small. But Kevin, you ask, where are the herbs in the Herb Garden? Well, I learned from experience not to plant perennial herbs in raised beds. They spread by underground roots, and smother everything in their path. Now I grow them in pots. Recently, I potted-up two kinds of mint, plus some strong-scented Mexican tarragon and heavenly variegated thyme. Did you know that fresh mint leaves are utterly divine in chocolate chip cookies? The treats are so cool and refreshing that I made a short video of the recipe for you. Click here to watch. At the top of a steep hill is the large(ish) Kitchen Garden. The 12 raised beds are cleaned out and ready to plant, but with what I do not yet know. I’m thinking potatoes. And onions. And leeks. Exiting the Kitchen Garden and heading north, we bump into the boxwood-framed path to the Woodland Garden. Can you tell that I love boxwood? 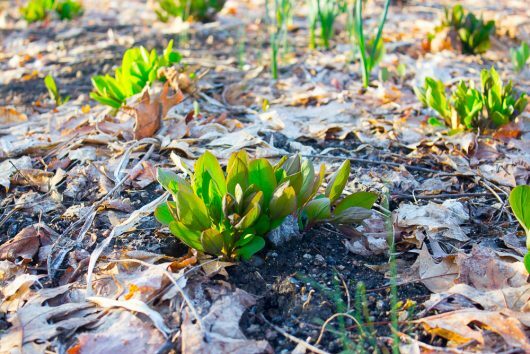 At the east end of the Woodland, daffodils and Virginia Bluebells are emerging. I’m so glad they made it through winter. I’m glad you made it through the harsh cold-season, too, and that you were able to join me on this muddy walk today. And in 4-inch heels, no less. Let’s slide down the hill and sit for a spell on the swinging bench in the Herb Garden. Then you can tell me what’s happening in your own neck of the woods. 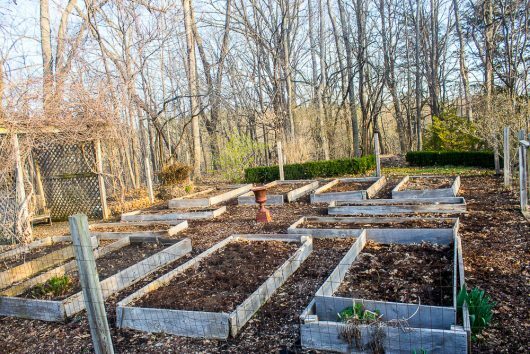 Is your garden thriving now, or just getting started? Your garden photos are always wonderful. My yard is waking up fast with the warm temperatures. I also have the sky blue Virginia Bluebells, just starting to show buds. Little pink Corydalis bulbs with ferny foliage have also popped. Snowdrops are going to seed. Weeks of mud finally dried up with some strong winds. Bees are hatching out all over. The robin is using the mud saucer for her nest-building mortar. I have trained her to stay away from my moist pots by offering saucers full of wet, orangey clay soil. Catbirds will do this too, but they have not arrived yet. Today I unpacked my Canna Lily tubers and found they overwintered very well in my attached garage (unheated, about 50 degrees in winter). My favorite Canna has burgundy foliage with a flaming paddle shaped red-orange flower, just eye-popping. It all makes for super excitement in April. My garden consist of one potted plant and some seeds I planted in a container that graces the rail on my patio. I’m thinking of getting potted tomato plants and other vegetables to put on my modified patio. Your garden tours are like therapy for me and the garden you showed transports me back to my Uncle Mius and Aunt Beulah’s garden many moons ago. 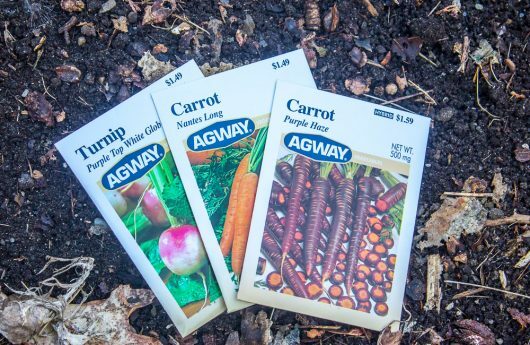 In additions to the carrots, potatoes, leeks and turnips, asparugus and celery, more vegetables from the allium family would also be healthy choices. I was delighted to happen upon your boxwood propagation instructions. Thank you! Early spring here in the Piedmont has brought massive aphid attacks on my David Austin roses, but a few of them are already showing buds. Azaleas are putting on a show, but most exciting is my attempt at a medieval knot garden is finally showing a pattern! It was started with your amazing boxwood propagation tutorial since I could not afford full size plants. I used dwarf green boxwood, dwarf gold box, and dwarf barberry in a knot pattern. After 3 years of suffering through my family’s skeptical looks at my pitiful little boxwood “sticks” and even a “Mom, if I give you the money will you go buy some real plants?” from my teenage daughter, I feel slightly redeemed. LOved your tour, Kevin, thank you. Seeing you love boxwood so much, I have a question. I started with I gallon of it and didn’t know what to do with it. Can’t get on k eesanymore to do propogating, etc. IT is heading for four feet tall this year. Finally have some daffodils in bloom. Everything else is just beginning to show signs of life after very late major snow storms here in Maine. Have celery and onion seedlings and some very tiny vegetable seedlings under grow lights. Have been raking and getting rid of leaves trying to slow down the tick population-lyme disease is a problem here. Will put compost around later. Your website is one of my very favorites! The photos are wonderful, instructions are easy-to-follow, recipes are tantalizing and your humor is delightful. Thank you for all you put into this labor of love. my first daffodil bloomed while I dreamt last night. Hey! I’m in ‘zone Spain,’ mediterranean climate. My husband has been cultivating an organic vegetable garden for 10 years that feeds at least 3 families. I putter around in the yard with the flowers. As the years go by we are getting more and more into seeds and heirloom varieties and also collecting them from neighbours’ plants or the wild. This begs for a greenhouse. Not wanting to erect something permanent without experimenting first, we slapped together something we can easily get rid of/repurpose at the end of this season. We chose a sunny wall, put two pallets perpendicular to it about 2 yards apart and covered it with a big, clear plastic tarp. That’s about it, except my husband decided to get all fancy and slide a board in there to make a shelf. A few bricks hold the tarp down at night. We started using it about 10 days ago and so far, so good. Happy Easter to you Kevin and your beagle. Who washes all your windows? Loved your tour Kevin! You are always giving me ideas here in NJ, always a pleasure to see your posts as well! Happy Easter!! the year, but the work is well worth it when you go out in the garden and gather up what you have planted and cared for. Thank for your tour and Happy Easter to you and all your followers. You have a beautiful place. i enjoy receiving and viewing your “delicious living” website. Nice tour – Here in Minneapolis, Mn the daffodils are blooming as the crocus fade. The Blue Bells are just starting to flower, the rhubarb is up with leaves just starting – the lettuce, spinach, and radishes are up in one of my raised beds and we are very wet after 2 1/2 inches of rain in the last few days. Kevin I tried to root boxwood last summer with no luck – I have larger cuttings do you think that was the problem. Do you start with very small cuttings? Thanks for your help! 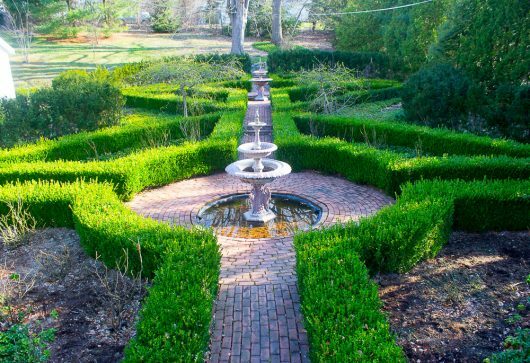 Loved your tour..Your home and gardens are amazing..I am in SC for the winter and the spring flowering so have been beautiful..I will be home in upstate NY the end of the month and my gardens will need desperate attention..I too love boxwood..Happy Easter!! Happy Easter…happy spring from Maryland! After MANY attempts to root boxwood cuttings with no successes, I now have 4 thriving little boxwood plants, thanks to your tutorial, and hopefully many more next year..THANKS, Kevin! Well, it didn’t work. I am so computer challenged! My roses are going crazy trying to out bloom each other and thought I would share, but don’t know how to send the pics within this Reply format. I feel somewhat redeemed here in the foothills of the Canadian Rocky Mountains that you are not much “greener” than we are. Woke up to a bit of snow but moisture is always needed. Cowslip are growing, grass is slowly greening up, lilac buds have a tint of green on the edges. But the most lovely sight of all is the arrival of the Mountain bluebirds. I have 2 nesting boxes so there is some activity around them. Plus a female bluebird who peeks in my windows and taps on them to get my attention. I’m sure she would come in the house if I opened the window. Having grown up in Wisconsin gardening here is still a huge challenge. Happy gardening in the months ahead. I wish my boxwood would winter over as well as yours. The ferocious, prairie winter winds dry them out terribly, so by spring they look more like straw than your lovely green. Thanks for the reminder to make your chive pesto. I tried it for the first time last year, and it was so addictive I couldn’t leave it alone. Our scillas have played their scene and exited in time for brunnera, daffodils, bleeding hearts, Virginia bluebells and tulips to take the stage. Clematis and lilac buds are fattening, and roses are leafing out. Blossoming blueberries, peaches, cherries and apples have provided a feast for the foraging early bees, and their pollination will provide a fruit harvest in due season. 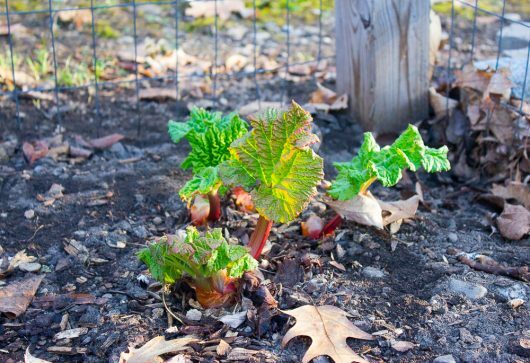 Rhubarb and sugar snap peas are up and growing, the fall sown garlic is nearly a foot high, potatoes, carrots, beets, spinach, lettuce, and parsnips are sown and starting to germinate. Still have to get the leeks and onions in, then try to maintain patience for the later, warm weather lovers. All the gardens are burgeoning with the many beautiful shades of spring green. Have to force myself to attend to tasks when I really just want to sit and marvel at all the wonders of nature. in contrast to your NY winter we had a mild one and a Very early spring The azaleas are mostly finished and the dogwoods are past their peak but still lovely . I live on a long dead end street and 50 years ago the owners planted dogwoods up and down the street in almost very yard so it is a fantasy land ! . Then a few years ago when the dogwoods had begun to shoe they were leaving … i organized a dogwood planting and we planted a whole bunch of new fresh ones for the future owners. . It’s a great street to live on with good n neighbors . My peas are about 8 inches tall now and the peonies are about a foot high already! Yay! . i’ will put in glads again this year because the resident coyotes on the back creek have chased away the deer that ate mine last year. (Yes, i do live in the city!) . . Time to go put out my wintersown seeds and see what surprises are there . . My neighbor up the hill bought too many Phlox , etc at the garden outlet and brought some down for me to add to my array. It should be gorgeous. he likes yellow and blue just like me. . . Thank you for sharing your garden! It’s gorgeous and I envy all your space. Here in Portland, OR, with land at a very high premium, I have to be happy with my little lot. I tried your winter sowing technique and am happy to say I have snap peas growing happily in the raised beds now and zinnia’s are still in there little jugs on the porch. They will be ready in another week or two! And thank you for the tip about boxwood propagating. So many inspirations!! Yes, thank you for the reminder about your chive pesto! We have chives all over the place, so it’s a good time use them. We’ve also got rhubarb so far along that I needed to pinch off flowers from some of them. Northern Indiana is usually several weeks behind PA and NY, but not this year. We’ve had daffodils and hyacinths out for weeks already, and the earliest of my tulips have just begun to bloom. I think I’ll make a rhubarb sauce for some vanilla ice cream we need to use up while we continue making our way through last year’s white scallop squash and poblano peppers, of which we still have gallons left. Wishing you and your wonderful garden a gorgeous spring! Thanks for the tour. Rural Colorado here. 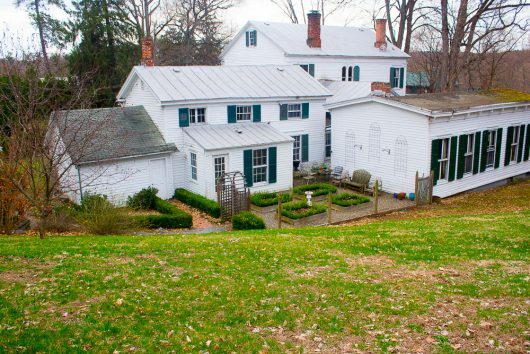 I don’t often travel up to the Hudson River Valley anymore, and since I’m mostly likely not there when you open your gardens for public tour, thank you for making it available here. This will be my first year growing turnips. I’ve 3 varieties, including a yellow one. Question: you wrote that turnips are best when small. Thanks too for that advice. But when will I know to harvest them at this small size? Here in the South, we are planting tomatoes, peppers, and eggplant. Have some yellow squash about ready for the garden. The weeds have just exploded! I always think I will beat them. But, newspaper and mulch will smother them! I am ready for some fresh garden veggies. Picked my first Peony the other day. Jealous? Thank you so much, Kevin for this delightful Easter stroll through your beautiful garden. I hope it stays this way for the year. Happy Easter, Happy Spring! Long Island weather is variable, but today it hit 80 degrees here on our North Shore so I went out after church and…. took boxwood cuttings. I was inspired by your earlier article on rooting it which I re-read last week, and promised myself I would do this. Now the cuttings are comfy in railing boxes on my deck, where I can give them tender loving care until their roots develop. Loved the garden tour! Our violets, minor celandine, and Japanese Coin plants are blooming. The bleeding heart are just putting out a bit of colour, and the lilacs have very small tight buds. Daffodils, tulips, forsythia, squill, chinodoxa and hyacinth are flowering. Tomorrow it may be chilly again, but today was glorious! Feels so good to get my hands in the earth again! It reached 85 degrees here is Portland Maine today. Couldn’t work fast enough to get things uncovered..
Bulbs just coming up. 60 degrees the rest of the week. Good working weather. Oh how I want to get into the garden!! I have all my seeds ( and I’m eyeing more.) and my sweet potato plants are ready to go but it will be at least another 6 weeks before the official planting date for me. Traditionally the garden gets put in on Memorial Day weekend. There is nothing better than the feeling one gets from spending the day in the garden playing in the dirt! I am kind of bummed that I can’t use chicken poo this year in the garden. I got chickens for Valentines Day but unfortunately the manure and straw has to age before using it. Right now it is too hot and has way too much nitrogen in it. It’ll have to sit over the winter for next spring’s garden. Glad to see you are planting purple carrots. You’ll love them. They have kind of a spicy flavor. Little kids love them. I think mainly because they are purple and not the old ho hum orange. Your carrot ginger soup will never be the same!! I have lots of sprouts in my milk jugs and in the garden I have various radishes and lettuces sprouting. First daffodil bloom opened today. I planted a dozen garlic last year and only 1 came up. I never saw any signs of them being dug up so cannot figure it out. I am excited to be sowing calendula for the first time. If I have time this summer I want to try my hand at making some homemade salves/ skin care products. 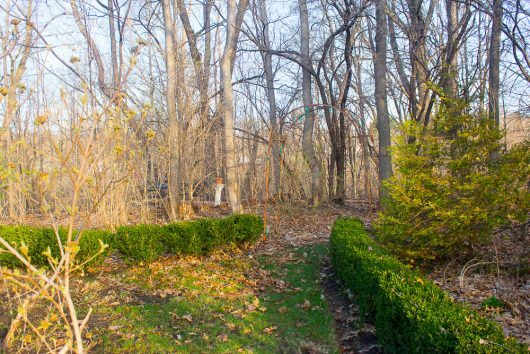 My other goal this season is to turn a soggy, shady corner of my yard into a mini-woodland garden. I’m planning on using your newspaper smothering tip and some mulch to clear the weeds and then take my time figuring out what to grow there. Here in northeast Ohio everything is in bloom at least a couple weeks early. Sorry, but while New York and New England had a hard winter, our winter was mild and we enjoyed a ridiculously early spring. In bloom today: tulips, apple trees, peach trees, weeping cherry (gorgeous just outside my window as I sit here typing) and the last daffodils – they started appearing in mid-March. Even the tons of snapdragons from my granddaughter’s school’s plant sale that I planted last year are coming back – aren’t they annuals? 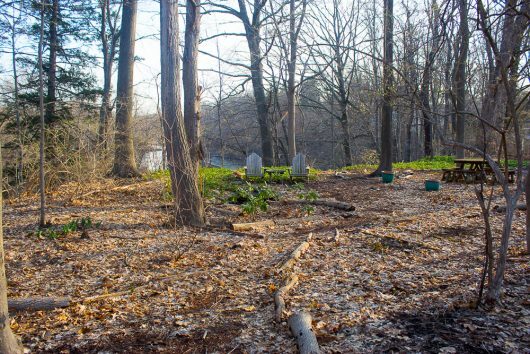 – they never lost their green all winter. And day after day I’ve been able to get out and muss around the yard. Could you please elaborate on taking the herbs out of the raised beds and putting them into pots. Will they stay alive more than one year in a pot? Do parsley and cilantro go into pots or into the raised bed? Ditto for sage, thyme, rosemary, basil, fennel? Hi Janet – Plants develop massive root systems when they grow in raised beds or the open garden. 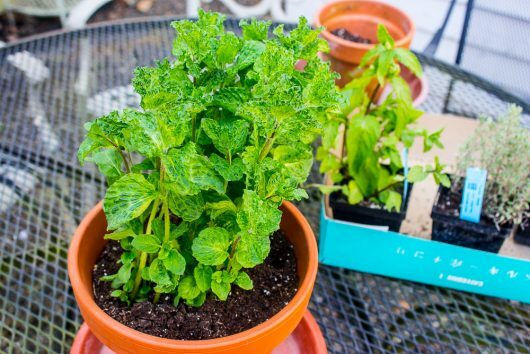 You’ll need to cut the roots in order to fit the plant into a pot. And you’ll need to cut top growth in equal proportion to the now-missing roots. I explained the how-to in this post: Overwintering Tender Herbs and Annuals (use the search box above; I’m having computer trouble at the moment and can’t post a link). Excluding fennel, I’ve potted and grown all of the herbs you mentioned. Pot size is determined by the size of the plant. Hi, Kevin. I haven’t stopped by in a while so I thoroughly enjoyed seeing your gardens today even though they are not in full form yet. I’m glad I wore my winter coat, though as it was nippy where you are. I am itching to get out and dig in the earth. We have had a few nice warm, sunny days over the last couple days here in lower mid-Michigan, but it has now turned cold again and rainy. But once the nicer weather hits again I am really ready to get out in the yard and flower beds. I have been reading a lot of home decor and up-cycling blogs and consequently neglecting you and A Garden. I had forgotten how much I enjoyed your posts and your sense of humor. I will not be so absent in future, I promise!